we decided to head to little italy for dinner. this time, at davanti enoteca, a new-ish (opened in the last year or so!) eatery located right on taylor street. 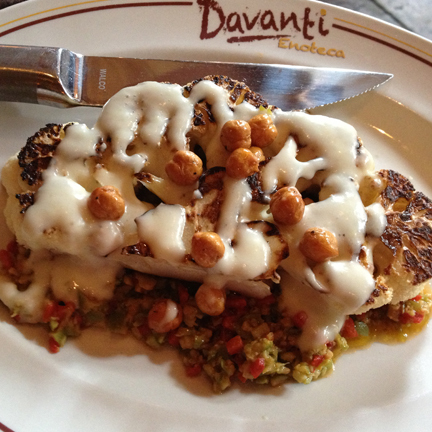 davanti enoteca features "simple italian fare" in a "rustic wine bar & restaurant. "sign me up. so delicious. perfectly cooked kale makes for a fantastic kale salad. sicilian olive tapenade, ceci beans & marinated lemon jam. yes, the marinated lemon jam looks like melted cheese. but it's not. this was good, but weird. i think it was the lemon. not a usual flavor combination. but the cauliflower was great. 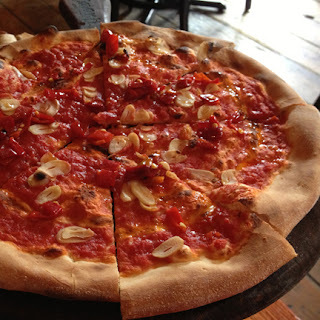 red sauce, garlic & calabrian chili. doesn't look like much, but tasted awesome. this is my kind of pizza. super thin crust, light tomato sauce. oh, & you know my m.o. ... i saved some of my kale salad and put it on top of my pizza. buenisimo. our server was a former vegan, so she knew what was up. and at first, she thought the pizza crust had honey in it (it used to) ... but a quick confab with the chef confirmed that it was vegan-acceptable. woop! 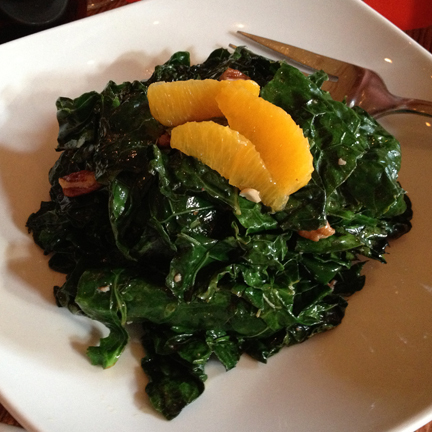 there were a couple other items on the menu that were adaptable, so you've got plenty of options. it's a great date night spot ... & perfect for a pre-baseball game meal. comiskey park (aka : u.s. cellular field).